Bobby and I headed for the islands on Lake Champlain this morning. We took our time getting on the ice even with knowing that we had to leave around noon to be back in time for me to get back to work. We pulled into the parking lot at 7:40am and hit the ice. At first, the fishing was slow. We started at the usual spot- no luck. We went shallower- no luck. We went deeper- no luck. Then we started to move side to side and started to find fish. The majority of the fish we pulled today were bluegill. On average, they were decent sized. It seemed like in most holes we would catch a few keeper sized fish then the small ones would take over. Although we spent a fair amount of time moving around it was pretty easy to tell when a hole was spent and it was time to find a new one. The outer limits of decent fish were pretty well defined. If the first drop yielded a chip you had gone too far. Both of us did good numbers of fish and a few crappies and larger pumpkinseeds were mixed in. 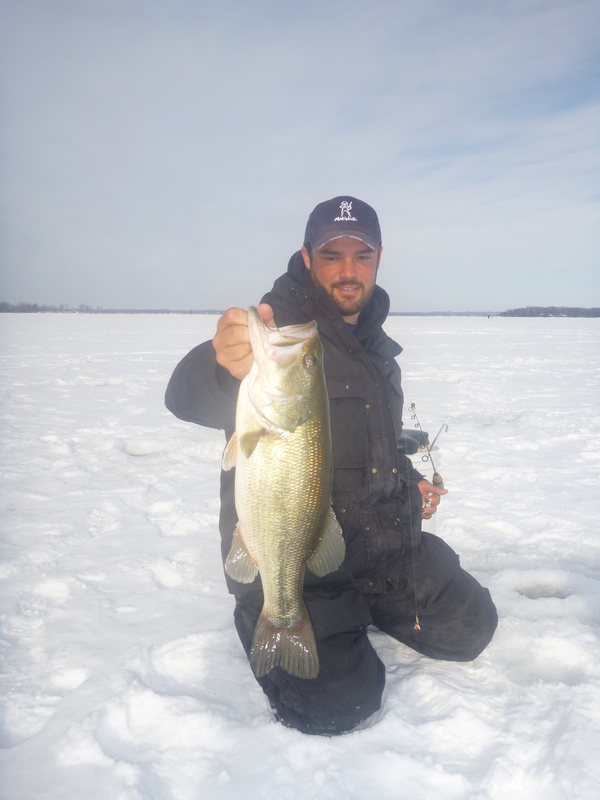 I found that most fish were suspended 2-4 feet below the ice and that they would hit it on the fall most times. I caught one big bass that gave me an exciting battle on a quick tip rod with 3 pound test line. It was 22″ and even though we didn’t have a scale it was well over 5 pounds. It was a great day to be on Lake Champlain. It’s not every day when you get sun and no wind to fish in up there! Toughest part of the day was that there was a few inches of snow to walk through. I guess it was good preparation for the coming days.